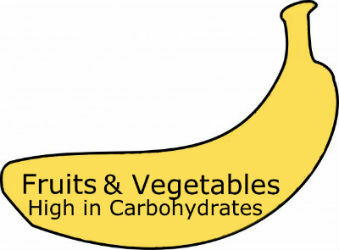 Fruits and Vegetables High in Carbohydrates | Eat This! If you’re watching your carb intake, you’re probably wondering which fruits and vegetables are high in carbohydrates. Here’s a list of some of fruits and vegetables high in carbohydrates. One medium banana has about 26.95 grams of carbs. A large banana has about 31.06 grams. One cup of loosely packed golden seedless raisins has about 115.30 grams of carbs. One cup of boiled sweet yellow corn has about 31.26 grams of carbs. One medium baked Russet potato has about 37.09 grams of carbs. One cup of raw, sweet cherries with pits contains 22.09 grams of carbs. A cup of raw, sour cherries with pits has 12.55 carbs. A cup of red or green grapes such as Thompson seedless has about 27.33 grams of carbs. A cup of raw mango has about 24.72 grams of carbs. One medium, pitted date has about 17.99 grams of carbs. One kiwi fruit has about 12.24 grams of carbs. One medium, raw fig has 9.59 grams of carbs. One dried fig has about 5.37 grams of carbs. One medium pear has about 27.52 grams of carbs. One cup of pineapple chunks contains about 21.65 grams of carbs. One medium navel orange has about 17.56 grams of carbs. One medium California Valencia orange has about 14.39 of carbs. One medium plum has about 7.54 grams of carbs. Half a cup of boiled beet slices has about 8.47 grams of carbs. One medium raw carrot has 5.84 carbs. A cup of grated raw carrots has 10.54 carbs. A cup of boiled carrots contains 12.82 carbs. A cup of raw chopped onions contains 14.94 carbs. Ten raw onion slices in rings contains 5.60 carbs.